The bathroom is one of the most resource-intensive rooms in the house. As the largest user of water and a major energy consumer, it’s a great place to target to reduce your home’s environmental impact. You can have a healthy, resource-efficient, and comfortable bathroom; below are the most significant steps you can take toward reaching this goal as you remodel. If your bathroom was built or remodeled before 1994, the toilet is using at least twice as much water as a modern model and your shower is using as much as triple today’s standard. That matters because every gallon of water used at home consumes fossil fuel during its extraction and chemicals during purification, and emits chemicals into our air and water during the wastewater treatment process. Wasting water also reduces supplies available for fish, wildlife, and ecosystems. Reducing water use is the most important thing you can do to make your bathroom environmentally sound; the good news is, it’s also one of the easiest, thanks to federal standards for maximum water use set by the Energy Policy Act of 1992. Toilets are the single largest user of water in the home, accounting for up to 28 percent of water use. Replacing an old toilet with a new model will instantly save water and money—up to $50 a year. A new 1.6 gallon-per-flush (gpf) toilet costs roughly $300 installed, paying for itself in six years and cutting water use in half—a savings of over 180,000 gallons of water during that period. Showers use 16 to 20 percent of an average U.S. home’s water. You can replace a showerhead inexpensively and quickly, cutting water use up to 70 percent. While the federal standard dictates a maximum flow rate of 2.5 gallons per minute (gpm), 1.5 to 2 gpm works as well and saves more water. An average household’s faucets account for 15 to 18 percent of indoor water use, and bathroom faucets tend to be the most heavily used. If you are installing new faucets, look for 0.5 to 1 gpm models; if you are retaining older faucets, install aerator heads. New dual-flush toilets use only 0.8 gallons or 1.6 gallons of water. GreenHomeGuide’s “5 Tips for Choosing a Low-Flow Toilet” offers an overview of dual-flush and other high-efficiency toilets. Touchless faucets that reduce wasted water are standard equipment in public restrooms today. These faucets are now available for homes, too. The water savings add up: leaving the water running while shaving or brushing teeth can waste 4 gallons per minute (200 gallons per week!). Some manufacturers have even introduced touchless models with solar-powered hand sensors. Greywater systems cycle water already used once in the shower or sink to the toilet bowl, eliminating fresh water use in the toilet. Learn more about greywater in this Ask A Pro article by green building consultant Jesse Terzi. Composting toilets, gaining popularity in Europe, avoid all water and its associated impacts, do not smell or pose a health hazard, and produce compost for local agriculture. See the Other Resources section at the end of this article for links to more information on these technologies. Water heating is the second-largest energy consumer in the house, accounting for 19 percent of home energy use, so reducing hot water use will reduce your home’s energy use as well. In addition, a gas water heater emits carbon dioxide, sulfur dioxide, nitrogen oxides and other pollutants wherever it’s located, and an electric water heater causes pollution at the source of energy generation, so the less energy you need to heat water, the less impact your bathroom has. Insulating your water heater and hot-water pipes is the easiest and least expensive option. Insulating the heater will reduce its energy use by 4 to 9 percent, according to findings by the Rocky Mountain Institute. Use one layer of R-8 or two layers of R-5 insulation. Insulating the pipes running from the water heater to the shower and faucets will save 5 to 10 percent on water heating costs and reduce the amount of water wasted as you wait for hot water to come out of the tap. Installing a hot water recirculation pump on the water fixture most distant from the water heater will save energy by cycling the water in your pipes back to the heater, avoiding the extra energy necessary to heat colder water drawn in from outside. By turning on the pump for less than a minute before you shower and moving hot water to the showerhead before you turn it on, you can virtually eliminate the waste of water while you’re waiting for it to heat. The cost of the system is paid back in energy and water savings in about three years. If you have access to the water pipes beneath your shower, another new technology to consider is a drainwater heat recovery system. This transfers heat from the hot water going down the drain to water flowing into the water heater, so the heater uses less energy to raise water back to its use temperature. The amount of energy saved depends on many factors, but 30 percent is achievable. See the Other Resources section at the end of this article for links to more information on both hot water recirculation pumps and heat recovery systems. If your heater is approaching the end of its 15-year lifespan, start looking at energy-efficient models now to avoid having to replace it hastily when it fails. Energy-efficient models cost more up front, but will save enough energy to pay for the difference in a few years, and then continue to save energy for a decade. Look for models that are insulated and have a heat trap at the top to prevent unnecessary cycling of hot water. See the Rocky Mountain Institute’s guide to home water heating (RMI Home Energy Brief #5), which calculates the payback time for many different types of water heaters. This Performance Comparison of Residential Hot Water Systems conducted by the National Renewable Energy Laboratory (NREL) found that tankless water heaters were up to 34 percent more efficient than traditional storage-tank water heaters. Natural gas heaters are more efficient overall, since they generate heat on-site instead of using electricity transmitted long distances. The bathroom generates a large amount of moisture each day, which can promote mold and mildew growth on bathroom surfaces as well as in wall and ceiling cavities if the room is not properly vented. This can create respiratory problems and require costly replacement of materials. 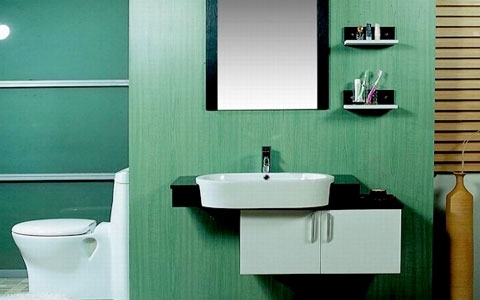 Additionally, the offgassing from building materials can cause buildup of toxic compounds in the bathroom’s air. Sufficient ventilation will help with both problems, and choosing building materials that do not affect indoor air quality will prevent toxics from getting into the air in the first place (see the Materials section below). Your bathroom’s ventilation system should exhaust at least 1 cubic foot per minute per square foot of floor area to the outside of your house, according to the Home Ventilating Institute. Bathroom fans that qualify for the Energy Star rating have met the EPA’s high standards for energy efficiency. Also, make sure that windows can be opened to provide replacement air, and seal air leaks around them with caulk, weatherstripping, or expanding foam. If you are replacing your bathroom windows, consider Energy Star or other efficient and insulating windows. They are more expensive, but will save energy over time. They may also help reduce condensation and thus be less prone to mold. Conventional bathroom materials such as vinyl flooring and acrylic shower stalls are derived from petroleum and are difficult to recycle or reuse. We recommend using flooring and countertop materials that are impervious to water and have cleaner manufacturing processes. Consider materials’ end of life as well, and give preference to materials that can be reused. Glass and ceramic tiles are a good all-around choice for bathroom surfaces. You can reuse tiles from your existing bathroom or other projects, and it’s easy to find new tiles with high recycled content. Plus, they are durable and easy to repair and clean. Wherever you use tile, choose tiles you can place a quarter-inch or less apart and can install using unsanded grout, which is more difficult for mold to take hold on. Using a latex-modified grout and a water-based grout sealer will increase the grout’s life and make it easier to clean. Shower walls are commonly made of fiberglass and acrylics; those are not green choices because their manufacture pollutes the environment and they have to be replaced more often than tile (they are usually made of a single piece of material that is difficult to repair). Because of the amount of water, dirt, and soap in the shower area, tile is the easiest green option. Reclaimed showers, tubs, and sinks are also good green options, and vintage fixtures add a unique aesthetic, but remember to refit them with low-flow showerheads or faucets. You can prolong the life of sinks and bathtubs by refinishing them. While the refinishing processes use some toxic materials and should be done only by a professional, it will keep materials out of landfills and avoid the environmental impacts of manufacturing a new sink or tub. For more information on refinishing, see the Bathtub Refinishing Referral Network. For guidance on reusing building materials, see the EPA’s resources for reducing construction and demolition waste. Tile, stone, and cement work well in the bathroom because they stand up to water, though they must be sealed to remain watertight. Stone can often be reclaimed from other projects, and all three materials are durable, helping to delay future replacements. Natural linoleum, made from such materials as linseed oil and pine resin, can be a good option, though some manufacturers do not recommend using it for bathroom floors (check the manufacturer’s instructions before you buy). Wood, cork, and bamboo are not recommended because although they can be sealed, there’s a good chance they won’t stand up to the constant exposure to water. Carpeting is not a good idea since it will stay wet and breed mold. See GreenHomeGuide’s Green Flooring Know-How section for more information about flooring materials. Bathroom countertops, like flooring, must withstand a lot of water, so consider materials such as tile and stone that can take the drenching and are easily maintained. For more information, see GreenHomeGuide’s Green Countertops Know-How section. Bathroom remodeling requires a lot of caulk to seal joints and plug leaks. Caulk often contains toxic substances that make it more durable or ward off mold but will build up in the air and harm you over time. Look for low-VOC caulk that lasts at least 10 years and cleans up easily with water or with a mild solvent. The EPA recommends polyurethane caulk for sealing masonry, though you need acetone for cleanup. Acrylic latex caulk, which cleans up with water, is good for dry surfaces like plumbing penetrations and gaps in wood. Both types last up to 20 years, far longer than most other caulks. For indoor projects, never use caulk meant for outdoor use and avoid using PVC- or oil-based caulk, since these last only three years. The amount of piping and wiring running through the bathroom, combined with the materials used, creates some unique situations and constraints. Moist air can move from the bathroom into the walls of other rooms, so you must seal any pipes or wiring where they enter the bathroom and insulate hot-water pipes to ensure that moisture cannot enter the walls and cause mold. Acrylic latex caulk is good for this type of sealing. If your existing bathroom has vinyl flooring made before the mid-1980s it may be backed with paper containing asbestos, which can easily get into the air during flooring removal. Consult your contractor for the best way to remove it safely. Alternatively, you can install a new floor over the vinyl tile, though this will make it harder to safely remove the asbestos in the future. Work with your contractor to ensure that you bring any reusable materials—such as tile, fixtures, bathtubs, slabs of countertop and the like—to architectural material exchanges so that others can use them for their own remodeling projects. Even with the most efficient toilets, fixtures, and materials, you have to be alert to problems like letting water run unnecessarily or leaving leaks unattended. A toilet with a leaking flush valve can waste 10 gallons of water per hour—and possibly cost you hundreds of dollars a year, negating the savings of a low-flow model. Using your new bathroom wisely and maintaining it well will multiply the savings from your remodeling project and ensure that you will not have to replace components before their time. The most important measure: Turn your hot water heater down to 120˚F. Many heaters are set at 140˚F, but if your dishwasher has a temperature booster, 120˚F should be adequate for the water heater. This will save 5 to 10 percent of your heater’s energy consumption, according to the U.S. Department of Energy. Lowering the thermostat will also prolong the heater’s life. If you have an electric heater, connecting it to a timer to reduce the temperature at night or while you’re on vacation will save even more energy. You can save thousands of gallons of water per year by installing a showerhead shutoff valve above the showerhead. This allows you to reduce water flow to a trickle while lathering, saving a few gallons per shower, which adds up quickly. Similarly, remember to turn off the water when you don’t need it while you brush your teeth or shave. If you keep your existing toilet, there is a simple way to save up to a gallon per flush. Fill one-liter bottles with water and a little gravel, seal them and place them one at a time in the toilet tank, out of the way of the flushing mechanism. Make sure the toilet still flushes satisfactorily before adding another bottle. Checking for tank leaks is easy. Put dye or food coloring in the tank and see if the color makes its way into the bowl, indicating a leak. For more information on detecting toilet leaks, see Toiletology 101’s page on toilet tests. To prolong the life of paints or wallpaper and prevent mold, run the fan after showering for 10 minutes, or until the mirror is completely clear. Because of the amount of wetness they face, bathroom materials will have to be sealed periodically, depending on their type. To keep air clean, use low-VOC and water-based sealants wherever possible. Greenguard Environmental Institute’s directory of Indoor Air Quality Certified products is a good place to find low-VOC products that will preserve your home’s indoor air quality. See GreenHomeGuide’s Ask A Pro series for advice from green professionals on selecting and applying eco-friendly sealers. Be sure to dispose of any toxic cleaning products or other materials properly rather than dumping them down the drain. Wastewater treatment plants that process the bathroom’s effluent are built to handle primarily organic materials and soaps. Disposing toxic materials down the drain could seriously disrupt the treatment process, causing costly repairs or temporary loss of service. Most bathroom products are not toxic, and many are packaged in recyclable containers. Check with your community’s recycling program to see which types of materials are recyclable, and take the extra minute to recycle that empty shampoo bottle. Follow the guidelines above on reducing water and energy use, improving air quality, and using low-impact materials during your bathroom remodeling process, and your new bathroom will be more efficient, less expensive to maintain and use, and a healthy part of your home. RMI’s recommendations and data on home water heating, including a chart comparing different types of water heaters and their payback times (Scroll down to Home Energy Brief #5). Tables of costs of bathroom surface materials, as well as resource efficiency considerations and recommendations on greening your washer and dryer. Information on and listings of Energy Star–approved ventilation fans, including where to buy. More on the dye test method described above, as well as plenty of practical information on residential toilets. FAQ about refinishing and restoring bathtubs and sinks, and links to local professionals. A more detailed discussion of recirculation systems. Keep in mind that we recommend only manually activated pumps, which are more energy-efficient than those that automatically circulate on a timer or based on the in-pipe water temperature. Environmental Home Center’s list of prices and features of different models of dual-flush toilets. An EPA factsheet explaining composting toilets.